Nehemiah Denton was born in Brooklyn in 1831. His grandfather died in 1844 leaving Nehemiah real estate valued at over $200,000. Born a deaf mute, Nehemiah attended the Institution for the Deaf and Dumb in New York City where he graduated in 1851. 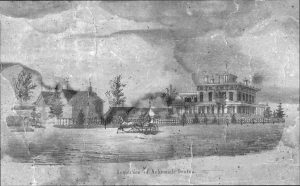 After graduation Nehemiah moved to Geneva where he purchased what had long been considered the “finest farm in Western New York” – Castle Farm. On July, 29 1852 he was married to Louisa A. Moore. Like Nehemiah, Louisa was deaf but her deafness was caused by an illness. Located on the outskirts of Geneva, Castle Farm consisted of approximately 200 acres and a Federal style structure. The Dentons incorporated that structure into their Italiante home. Nehemiah and Louisa had two daughters (Louise and Helena) and the Denton family resided on this property until 1882 when the farm was sold to New York State for the Agricultural Experiment Station (now Cornell AgricTech). Louisa died in 1886 and Nehemiah in July 1895. For nearly 40 years Mrs. Laura A. Youngs resided in the Denton household and was a family friend caring for the aging Nehemiah and attending to the household responsibilities until the time of his death. Laura was named as the beneficiary in his will which was protested by Nehemiah’s daughter and grandson. Both alleged that Nehemiah was “insane.” Nehemiah was known to his friends and family as very “competent” and “mentally above average.” He was also very well known among the deaf community and considered “generous in his hospitality.” Despite Nehemiah’s numerous accomplishments and education, the Surrogate Court of Geneva refused to admit the will into probate siting that Nehemiah had been incompetent. Mrs. Youngs was left homeless and penniless with failing health. The Friends of Parrott Hall, in conjunction with the Geneva Historical Society, is currently seeking donations to restore Nehemiah’s house situated on North Street. This building has a rich history which the Friends hope to preserve with the creation of the “Parrott Hall of Science.” If you are interested in making a donation please visit https://genevahistoricalsociety.com/support/make-a-donation/or call us at 315-789-5151.